French marathon swimmer Benoit "Ben" Lecomte sets off from Choshi, Chiba, in Japan on Tuesday, June 5, 2018, on his attempt at swimming across the Pacific Ocean. Professional distance swimmer Ben Lecomte set off from Japan to San Francisco on Tuesday in an attempt to become the first person to swim across the Pacific Ocean. Spokesman Alexandre Borreil said Lecomte left at 8 a.m. on Tuesday from Choshi, Japan, which is northeast of Tokyo in neighboring Chiba prefecture. He is expected to swim eight hours daily on a journey that could take six to eight months and will cover about 8,000 kilometers (5,000 miles). "For the moment we know he left and everything went well," Borreil said. 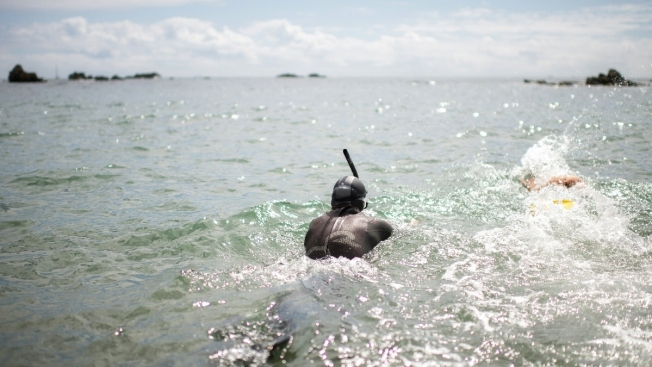 He's doing this swim to raise awareness about the health of the world's oceans and the threat of pollution.